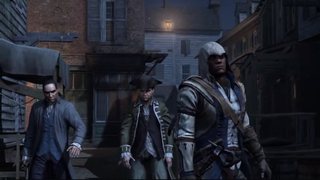 Maybe you're getting sick of Assassin's Creed III footage. Maybe you just want to play the new stealth-action-adventure game, which comes out in a month or so. That's okay. I don't blame you. But if your appetite for footage from the next Assassin's Creed game has not yet been sated, check out last night's episode of GTTV. It's packed full of Assassin's Creed III gameplay clips and details, some of which we've seen before, some of which we haven't. In the last segment, Nintendo of America president Reggie Fils-Aime comes out and chats with host Geoff Keighley about the Wii U. Not much new information there, but Fils-Aime does promise lots more big first-party games, including something by Retro Studios (the folks behind Metroid Prime and Donkey Kong Country Returns).